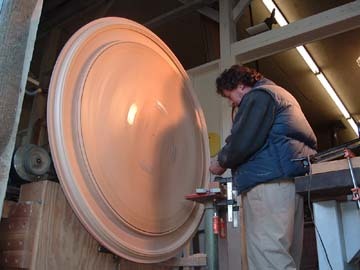 Ferenc turns a disk of mahogany with a diameter of four feet. Owned and operated by Ferenc Tobak, and offering the finest craftsmanship in custom and production woodturning services in Northern California. 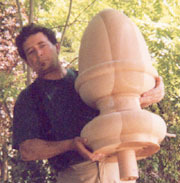 With professional woodturning experience of over 25 years, and in Northern California since 1991, we work closely with our clients and have been able to provide a high level of satisfaction at all times. 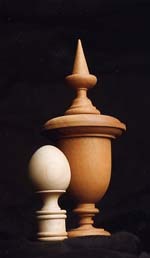 Our woodturning experience is extensive and includes a variety of products from drawer pulls to lamps to classical columns. We have a strong background in architectural turning and particularly, historical restoration with its demands for matching damaged or missing architectural and furniture elements. We work equally well from blueprints, samples or photographs, and use both the metric and standard systems of measurement. for a shopping mall in Walnut Creek, CA.